Downtown urban living with vintage flair at 909 Flats gives you everything you desire within minutes. Check out the Nashville Farmer's Market just across the street with fresh produce, classes, events and great food. Walk to games to cheer on the Sounds or stay in and catch the fireworks on Friday nights from First Tennessee Park. Don't miss the Predators at the Bridgestone Arena or Titans at the Nissan Stadium, both within two miles. Celebrate the best of country music at the Country Music Hall of Fame and Museum and drive 10 minutes to The Parthenon to indulge your artistic side. Experience all downtown has to offer! 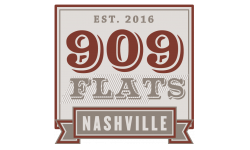 Stop by our Downtown Nashville apartments today!